The Soyuz spacecraft (21S), with Astronaut Soichi Noguchi aboard, docked at the International Space Station at 7:48 a.m. on Dec. 23 (Wed., Japan Standard Time.) At 9:30 a.m. (JST), the hatch to the ISS was opened and Astronaut Noguchi started his long-term stay at the ISS as a crewmember of the 22nd expedition crew. The Soyuz will dock with the International Space Station at 7:54 a.m. on the 23rd (Wed.) JAXA will broadcast a live report of the docking from 7:30 a.m. and the Soyuz hatch opening to the ISS from 9:00 a.m. on the 23rd through the Internet. You can also watch the reports at JAXA i. Don’t miss them! We are accepting support messages to Astronaut Noguchi. Please support and encourage Astronaut Noguchi, who will play an important role as an flight engineer during this mission. *Date and time of the live reports are subject to change due to mission progress status. JAXA will broadcast a live launch report of the Soyuz spacecraft mission (21S), which Astronaut Soichi Noguchi will be aboard by connecting the Baikonur Cosmodrome and JAXA’s Tsukuba Space Center. The launch is scheduled for Dec. 21 (Mon.) and the live report will begin at 6:00 a.m. JAXA i will also open at 6:00 a.m. to provide a public viewing service. We are accepting your messages to Astronaut Noguchi. Your support and encouragement for his mission is highly appreciated. * The date and time of the live report are subject to change due to launch preparation status and weather conditions. The launch day and time of the Soyuz Spacecraft (21S,) which Astronaut Soichi Noguchi will be onboard, was officially announced at 6:52 a.m. on December 21 (Mon, Japan Standard Time.) Astronaut Noguchi will stay at the International Space Station (ISS) for about six months as a crewmember of the 22nd and 23rd expeditions. We began to accept support messages for Astronaut Noguchi. We are looking forward to receiving your encouraging messages! Let's set sail for the solar system by a solar yacht! A yacht travels through the ocean using wind pressure. Thus, theoretically, solar sails should move their way through space by receiving pressure from solar lights. JAXA and the Planetary Society of the U.S. will launch "IKAROS (Interplanetary Kite-craft Accelerated by Radiation Of the Sun)" and "LightSail-1" respectively in Japan Fiscal Year 2010 to carry out verification tests on this technology. Taking this opportunity, the two organizations would like to hold a message campaign together to ask your support for the two missions. 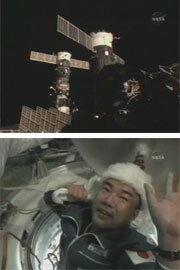 JAXA is offering a chance to send a holiday message from space again this year as it was very popular last year. You message will be transmitted through the Wideband InterNetworking engineering test and Demonstration Satellite "KIZUNA," which flies at an altitude of about 36,000 km, on December 24. We will accept your message by 5:00 p.m. on December 18 (Fri., Japan Standard Time.) You can also register through the JAXA mobile site. Why don't you send a message to a loved one from space? Astronaut Koichi Wakata, the first Japanese to stay on the ISS for a prolonged period oftime, received an award from Prime Minister Yukio Hatoyama on Nov. 25. Astronaut Wakata is the fourth astronaut to receive the prize following Astronauts Mamoru Mori, Chiaki Mukai, and Takao Doi. On November 4, JAXA found that one of the main ion engines aboard the Asteroid Explorer "HAYABUSA" had autonomously stopped during the second propulsion period in its return cruise back to the Earth. As a result of studying the measures to cope with this situation, JAXA confirmed that we can gain thrust power that is equivalent to that of one engine by combining the neutralizer of the Thruster A and the ion source of the Thruster B. We believe that the HAYABUSA will be able to maintain its current return schedule to the earth around June 2010 as long as we can sustain the current conditions and sequence of operation. We will attentively monitor its return trip. Astronaut Akihiko Hoshide was selected as a crew member of Expedition 32/33 to stay on the International Space Station (ISS) for a prolonged period. Astronaut Hoshide installed the Pressurized Module of the Japanese Experiment Module “Kibo” onto the International Space Station in June 2008. Astronaut Hoshide is scheduled to go to the ISS on the Soyuz spacecraft in the early summer of 2012 and stay there for about six months. He will engage in space activities mainly for space environment utilization, including scientific experiments coordinated by Japanese scientists and international partners at the ISS. JAXA is currently planning several exciting missions for JAXA astronauts. These include Astronaut Soichi Noguchi's scheduled stay on the ISS from the end of this year, Astronaut Naoko Yamazaki's trip to space on a Space Shuttle in the spring of next year, Astronaut Satoshi Furukawa's long-stay on the ISS in 2011, and Astronaut Hoshide's expedition at a future date. The H-II Transfer Vehicle (HTV) Demonstration Flight, which departed from the International Space Station (ISS) on October 31, re-entered the atmosphere at around 6:26 a.m. on November 2. The HTV successfully completed its cargo transportation operations to the ISS, and accomplished all its missions in about 52 days following the re-entry today. The H-II Transfer Vehicle (HTV) Demonstration Flight, which is currently berthed at the International Space Station (ISS), is scheduled to depart from the ISS at 2:30 a.m. on Oct. 31 (Sat) (Japan Standard Time, all the following days and times are in JST.) The HTV will be unberthed from the ISS by the ISS robotic arm (SSRMS) late at night on Oct. 30 (Fri) after its hatch to the ISS is closed at dawn of Oct. 30, then depart from the ISS. If everything goes smoothly, the HTV will re-enter the Earth's atmosphere around 6:25 a.m. on Nov. 2 (Mon). We will broadcast a live report of the HTV unberthing and departure from the ISS through the Internet from 11:45 p.m. on Oct. 30 (Fri) and from 2:15 a.m. on Oct. 31 (Sat) respectively. (Sorry, the live reports are broadcasted only in the Japanese language.) Please enjoy the HTV live reports over the weekend! *The live broadcast time schedule has changed due to the delay of the HTV departure. The Venus Climate Orbiter "AKATSUKI" (PLANET-C,) which is scheduled to be launched in Japan Fiscal Year 2010, will reach the orbit of Venus about half a year after its launch. It is scheduled to explore the Venus atmosphere for some two years. JAXA will deliver your name and message to Venus on this Venus explorer. We accept messages both from individuals and from a group such as a message from a school or a work place. Please participate in the message campaign by yourself, with your family, or with your friends. We are looking forward to receiving your thoughts. We will accept your messages up to December 25. The Quasi-Zenith Satellite (QZS) is a positioning satellite to provide highly accurate GPS functions for car navigation and movable phone services in areas congested with skyscrapers and mountainous regions in Japan. The first QZS (QZS-1) is scheduled to be launched in Japan Fiscal Year 2010. JAXA would like you to give a nickname to the QZS-1. We will invite the godparent (if a multiple number of people give us the same name that is chosen as the QZS-1 nickname, we will hold a lottery to select one) to the Tanegasima Space Center to see off the departure of the QZS-1 to space. We will accept a nickname by 5:00 p.m. on December 16, 2009. Our annual autumn open-house events for Space Day and Sky Day will be held at our facilities. On Oct. 17 (Sat,) we will hold an open house at the Tsukuba Space Center (TKSC.) We will introduce our various activities and achievements at the TKSC under the catchphrase, "Here is Tsukuba! Let's deliver everybody's dreams to space." We plan to connect Tsukuba and Houston to receive messages from Astronaut Noguchi and Astronaut Yamazaki. We are also preparing other interesting events to make you feel familiar with space and both parents and children can enjoy events such as a plastic-bottle rocket class, which is very popular every year, rocket launch acoustic experience, and a craft corner. As part of our "Eco Campaign," We will give a memento to those who come to the event on foot, by bicycle, or by public transport. Please come and join us. The Exposed Pallet of the H-II Transfer Vehicle (HTV) Demonstration Flight was retrieved and stored back in the HTV Unpressurized Carrier at 10:20 p.m. on Sept. 25 (Japan Standard Time) by the robotic arms of the Kibo and the International Space Station (SSRMS) after its two cargoes, the experiment devices in the unpressurized environment, had been installed in the Kibo’s Exposed Facility. JAXA will broadcast the live reports of the ISS robotic arm capturing the HTV from 4:00 a.m., and the berthing of the HTV at the ISS from 7:00 a.m. They are early in the morning, but don’t miss them! The Japan Aerospace Exploration Agency (JAXA) launched the H-II Transfer Vehicle (HTV) Demonstration Flight aboard the H-IIB Launch Vehicle Test Flight (H-IIB TF1) at 2:01:46 a.m. on September 11, 2009 (Japan Standard Time, JST) from the Tanegashima Space Center. The launch vehicle flew smoothly, and, at about 15 minutes and 6 seconds after liftoff, the separation of the HTV Demonstration Flight was confirmed. Live Launch Report starts at 1:30 a.m. The launch time of the H-IIB Launch Vehicle Test Flight with the H-II Transfer Vehicle (HTV) Demonstration Flight onboard was set for 2:01:46 a.m. on September 11 (Fri.) A dynamic live launch report will be broadcasted via the Internet from the Tanegahima Space Center. JAXA hires another astronaut candidate! JAXA decided to hire another astronaut candidate who will be on the backup list in addition to the two astronaut candidates who were hired by JAXA in April. The astronaut candidate selected this time will go through training, and be certified as a JAXA astronaut upon completion of the training. After that, if he is chosen as an astronaut to travel to the International Space Station (ISS), he will further take mission-specific training to stay at the ISS for conducting operations and maintenance of the ISS including the Japan Experiment Module "Kibo" and various space experiments. The H-II Transfer Vehicle (HTV) Demonstration Flight and the H-IIB Launch Vehicle are undergoing final launch preparations at the Vehicle Assembly Building waiting for their launch on Sept. 11 (Fri.) JAXA will broadcast a live launch report through the Internet from 1:30 a.m. on Sept. 11th (Japan Standard Time.) You can enjoy the dynamism of the launch at the Tanegashima Space Center from your home. We welcome your supportive messages to the HTV and H-IIB project teams who are working hard to be ready for the launch. * The date and time of the live launch broadcast are subject to change due to the orbit of the International Space Station, launch preparation status, weather conditions and other factors. On August 30, the encapsulated HTV Demonstration Flight was transported to the Vehicle Assembly Building (VAB.) It will be loaded onto the H-IIB Launch Vehicle to be ready for the launch on September 11. We published a promotion movie of the HTV/H-IIB mission. Please watch it before witnessing the actual launch! On August 21, the H-II Transfer Vehicle (HTV) Demonstration Flight was mated with the Payload Attach Fitting (PAF) at the Spacecraft and Fairing Assembly Building #2. On the 23rd, the HTV on the PAF was encapsulated by the payload fairing, which covers the payload to protect it from air resistance, friction and the acoustic vibrations of launch. The fairing for the HTV is a 5S-H type and is about 5 meters in diameter and about 15 meters in length. It was developed for the HTV launch. The encapsulated HTV Demonstration Flight will be transported to the Vehicle Assembly Building (VAB) and loaded onto the H-IIB Launch Vehicle Test Flight. The Space Shuttle "Endeavour," which Astronaut Wakata was aboard, landed at the NASA Kennedy Space Center (KSC) at 11:48 p.m. on July 31 (Japan Standard Time.) Astronaut Wakata successfully achieved all of his missions during his extended stay in space of 137 days, the longest mission ever for a Japanese at the International Space Station (ISS). Astronaut Koichi Wakata moved to the Space Shuttle "Endeavour," and it was detached from the International Space Station (ISS) at 2:26 a.m. on July 29 (Japan Standard Time.) He vowed his farewells to the ISS, where he stayed for 133 days engaging in various missions including the assembly work of the Japanese Experiment Module "Kibo." The Exposed Facility of the Japanese Experiment Module “Kibo,” which was attached to the International Space Station (ISS) on the 19th (Japan Standard Time, all the following dates and times are JST) is a laboratory exposed to space to carry out various experiments in the environment of space. A total solar eclipse was observed from Japan on July 22 for the first time in 46 years. The Greenhouse Gases Observing Satellite "IBUKI" took some images of this astronomical event including a shadow of the moon on the earth. The Solar Physics Satellite "HINODE" also observed the moon crossing in front of the sun. The Space Shuttle "Endeavour" with the Kibo's Exposed Facility (EF) and Experiment Logistic Module (ELM) Exposed Section onboard was launched at 7:03 a.m. on July 16 (Thu. JST, or at 18:03 p.m. on the 15th, EDT) from NASA Kennedy Space Center. During the 2J/A mission this time, the EF will be attached to the Kibo Pressurized Module to complete the construction of the Kibo's Japanese experiment facility. In addition, the ELM Exposed Section will be assembled to the EF so that exposed experiment devices will be moved and installed onto the EF. Astronaut Koichi Wakata will finally come home to Earth on the Endeavour. Please come and join us and create some great summer memories! The comprehensive ground test for the H-IIB Launch Vehicle using the Ground Test Vehicle (GTV) was held at the Tanegashima Space Center on July 11. Although the GTV was not equipped with the fairing, the flight engine and four Solid Rocket Boosters (SRB-As) were attached. During the test, the exact same procedures as the real launch procedures were followed up until the engine ignition for the final confirmation of the vehicle, ground facilities and operation procedures. The HTV has been fully assembled at the Tanegashima Space Center, and it will be under final launch preparations including comprehensive checkout and propellant loading to be ready for launch. The ground comprehensive test for the H-IIB Launch Vehicle using the Ground Test Vehicle (the GTV test) is scheduled on the 11th. Please check the updated information on the HTV and H-IIB at the "HTV/H-IIB Special Site." We hope you enjoy the site. The mission is to ship the Exposed Facility and Experiment Logistic Module Exposed Section of the Japanese Experiment Module "Kibo" to the ISS. The new launch schedule was set after a hydrogen gas leakage, the cause of the launch delay, was confirmed to be repaired. With this 2J/A (STS-127) mission, construction of the Kibo will be completed, and Astronaut Koichi Wakata, whose stay at the ISS has reached over 100 days, will come home to earth on the Endeavour. JAXA released final still images taken by the High Definition Television (HDTV) of the lunar explorer "KAGUYA," which was maneuvered to be dropped onto the Moon's surface on June 11. We also provided a 3D movie compiled based on observation data captured by the Terrain Camera (TC) about 12 minutes prior to its landing on the Moon, and the last observation data of the Multi-band Imager during the second last revolution ahda of the last one before hitting the Moon. We plan to hold a public event "Fly me to the Moon in AKIBA" to commemorate the completion of the KAGUYA mission in Akihabara (Tokyo) on July 18 and 19. Please come and join us. The launch of the Space Shuttle Endeavour with the Exposed Facility and Experiment Logistic Module Exposed Section of the Japanese Experiment Module "Kibo" onboard has been postponed again as leakage was found in a hydrogen gas vent line during hydrogen loading into the propellant tank. With this 2J/A (STS-127) mission, the assembly of the "Kibo" will be completed. Astronaut Wakata, who has been at the ISS as a crewmember of Expedition 18/19/20 since March, is slated to come back to Earth on the Shuttle after completing the assembly. The lunar explorer "KAGUYA" was maneuvered to be dropped around 80.4 degrees east longitude and 65.5 degrees south latitude onto the Moon at 3:25 a.m. on June 11 (Japan Standard Time.) The KAGUYA carried out global observations of the Moon for 17 months since its launch on September 14,2007. We are now asking people all over the world to provide us with images of the collision flash generated when the KAGUYA hits the Moon's surface, if someone successfully captures this feat. The KAGUYA's observation data will be released through the Internet from Nov. 1. The "JAXA Symposium" marks its fifth anniversary this year. We will hold it from 6:30 p.m. on July 9 (Thu) at Yurakucho Asahi Hall (Chiyoda-ku Tokyo.) This year's theme is "From the Kibo to deeper into space." We will welcome Ms. Mitsuyo Kusano (announcer) as a navigator, and will present JAXA's space activities in an easy-to-understand way. The various topics cover from popular activities such as space medicine at the Japanese Experiment Module "Kibo" to less familiar themes such as astronomical observations to elucidate deep space. Some 750 people can join us on a first-come, first-served basis, so don't be late to register. You are welcome to visit on your way home from work. The KAGUYA, who carried out its regular operations for about 10 months and post-operational observations for about 7 and half months, is scheduled to be maneuvered to be dropped around 80.4 degrees east longitude and 65.5 degrees south latitude on the moon's front-side surface at 3:25 a.m. on June 11 (Japan Standard Time.) As the KAGUYA's expected landing position is in the shade on the Moon, we many be able to witness some flash from its collision; therefore, we are now informing all related organizations both in Japan and overseas of its falling time and location. * Based on the latest analysis of the orbit as of June 10, we updated the KAGUYA's falling location. * Please note that the KAGUYA's falling time and location are subject to change as we further analyze its orbit and conditions. Many more JAXA spring events are coming up! The Earth Observation Center (EOC) (Hatoyama-machi, Saitama Pref.) will have an open-house on Sat., May 16th. Many events such as a hand-made rocket launch and an Eco rally await you. There will also be open-house events at the Okinawa Tracking and Communication Station (Onna-son, Okinawa Pref.) on Sat., May 23rd, and at the Masuda Tracking and Control Station (Nakatane-cho, Kagoshima Pref.) on Sun., May 31st. As the days get hotter and summer is just around the corner, please take measures to avoid heat stroke when visiting our facilities. On April 22 (Wed.), the second captive firing test (CFT) was held for the first-stage flight model tank of the H-IIB Launch Vehicle at Launch Pad 2 at the Yoshinobu Launch Complex, Tanegashima Space Center. The firing duration was only 10 seconds for the first CFT, but the second CFT was conducted for 150 seconds. This time, we verified the tank pressure characteristics and acquired environment data including vibration data on each part of the launch vehicle. JAXA Spring Events : Visit JAXA again during Golden Week! JAXA held an open house event at Tsukuba Space Center, Chofu Aerospace Center, and Kakuda Space Center on April 18 and 19. We were very happy that many visitors came to our facility. We recoded 18,011 visitors at Tsukuba, 7,815 at Chofu and 1,244 at Kakuda. During Golden Week, JAXA i, the JAXA information Center, will hold "Spring Kids Day 2009" on April 26 (Sun.) We will have a lot of fun events on that day including games and space experiment shows that will make visitors feel closer to space. A monthly talk event will also be held on April 26 especially for children. JAXA i will be open during Golden Week. It is only a one-minute walk from Tokyo Station. Please stop by at JAXA i on your way to a trip or on your way back home! JAXA is holding various spring events for the JFY 2009 Science Week (April 13 to 19) at our field offices in Japan. As a starter, we held a meeting for “Space Science Lectures and Movies” on the 11th (Sat.) On the 18th (Sat,) an open-house event is scheduled at the Tsukuba Space Center, then at the Chofu Aerospace Center and Kakuda Space Center on the 19th (Sun.) At Tsukuba, one of the most popular corners, a class for making a plastic rocket, will be held. The Chofu Aerospace Center also plans to have a lot of interesting events including some experimental classes such as one for making an engine. At Kakuda, you can enjoy the Space Development Exhibition Room, which was just completed with its renewal and re-opened on April 1. At the JAXA information center (JAXA i), we will host “Spring Kids' Day 2009” on the 26th (Sun.) Children can learn more about the space environment and astronauts through experiments and games. We have various events that can be enjoyed by both parents and children. Please join us! On April 2 (Thu.) a captive firing test (CFT) for the first stage flight model tank of the H-IIB Launch Vehicle was held for the first time at Launch Pad 2 in Yoshinobu Launch Complex, Tanegashima Space Center. The H-IIB is a new large-scale rocket whose launch capability has been improved compared to the H-IIA Launch Vehicle by installing two H-IIA first stage engines, or LE-7As, and by enlarging the first stage diameter from 4 meters to 5.2 meters. During the CFT, an engine firing test was carried out by using an actual flight tank at the launch pad where the first H-IIB will be launched to verify the launch vehicle and ground systems. Astronaut Wakata: Live communication by connecting Fukuoka and space! Astronaut Wakata, who saw the Discovery off as he is staying on the ISS, held a live communication program after the ISS Japanese Experiment Module “Kibo” was connected with Kyushu University in Fukuoka from around 9:00 a.m. on the 26th (JST.) He answered several questions during the event. On March 20 (Japan Standard Time, JST) the S6 truss, the final truss of the International Space Station (ISS,) was installed. Astronaut Koichi Wakata manipulated the ISS robotic arm, the Remote Manipulator System (SSRMS), from the inside of the ISS to move the S6 truss, which weighs about 14 tons, to its final installation position. On the 21st (JST), the solar array paddle that was stowed in the S6 truss was fully deployed, and, with that deployment, electric power that is sufficient for six crew members to live on the ISS can be supplied. On the 22nd (JST), a GPS for the Proximity Communication System was attached on the top of the Experiment Logistics Module Pressurized Section of the Japanese Experiment Module “Kibo” in order to be ready for the docking of the H-II Transfer Vehicle (HTV), a cargo supply ship to the ISS. The HTV is scheduled to be launched within Japan Fiscal Year 2009. The Space Shuttle “Discovery,” with Astronaut Koichi Wakata aboard, docked with the International Space Station (ISS) at 6:20 a.m. on March 18 (Wed, Japan Standard Time, JST,) and the STS-119 crew, including Astronaut Wakata, entered the ISS at 8:09 a.m. (JST) Astronaut Wakata then began his stay on the ISS at around 11:00 a.m.(JST,) becoming a member of the Expedition 18 crew and the first Japanese to stay in space on a long-term mission by replacing Astronaut Sandra H. Magnus. The "Discovery" will dock with the International Space Station (ISS), and Astronaut Wakata will stay there for about three months as a member of the Expedition 18 crew. SPACE@NAVI-Kibo SPECIAL LIVE will broadcast the moment when Astronaut Wakata starts his long-term stay mission on the ISS through the Internet from 7:25 a.m. on the 18th (Wed.) Don't miss it! The launch date and time for the Space Shuttle "Discovery" with Astronaut Wakata aboard have been reset for 8:43 a.m. on March 16 (Japan Standard Time.) Astronaut Wakata is the first Japanese astronaut who will stay in space for a prolonged period of time. Please encourage him. *The date and time of the live broadcast are subject to change due to the preparation status or weather conditions. *The live broadcast may be cancelled in some public viewing areas due to schedule conflicts as the launch date and time are subject to change. JAXA will broadcast the launch live from 9:50 a.m. on the 12th (Thu, JST) by connecting the NASA Kennedy Space Center and the JAXA Tsukuba Space Center. You can enjoy the live broadcast via the Internet and at some public viewing sites including JAXA i.
Astronaut Wakata will be the first Japanese astronaut who will stay on the International Space Station for an extended period, about three months. He will engage in the construction and installation of the Japanese Experiment Module “Kibo,” the Exposed Facility and the Experiment Logistics Module Exposed Section. After completing his work on the Kibo, he will return to Earth. JAXA plans a live broadcast of the Discovery launch through the Internet and at JAXA i. We are continuing to accept supportive messages for Astronaut Wakata. New JAXA astronaut candidates selected! JAXA has been recruiting and selecting new astronaut candidates who are expected to stay on the International Space Station (ISS) to operate the ISS. Today, we are pleased to announce that two candidates were selected. They will go through training for two years as a candidate, and if they become certified after the training, they will officially become astronauts. Upon receiving certification, if they are selected as an ISS onboard astronaut, they will further undergo some mission-specific training for about two years, then they will be stationed at the ISS for up to six months. At the ISS, they are expected to be in charge of operations and maintenance of the ISS including the Japanese Experiment Module “Kibo” and carrying out various space experiment missions. * A penumbral lunar eclipse is a phenomenon in which the Sun, Earth and Moon line up in tandem, hence the moon is in the Earth's penumbra, or, when you look from the Moon, the Sun is partially covered by the Earth (partial eclipse.) When the phenomenon occurs, the volume of light from the Sun to the Moon decreases, thus the Moon surface looks darker when you look it from the Earth. Four KAGUYA research reports using observation data from the Terrain Camera (TC) onboard the KAGUYA and a perspective titled "Seeing the Missing Half" were published as part of a KAGUYA special edition in Science Magazine dated February 13, 2009. The observation image taken by the TC was also featured on the cover page of the Magazine. JAXA successfully acquired the “First Light” by the Greenhouse Gases Observing Satellite “IBUKI” (GOSAT) during the course of its initial functional check. The data was acquired by the onboard sensors of the IBUKI, the Fourier Transform Spectrometer (TANSO-FTS) and the Cloud and Aerosol Imager (TANSO-CAI), which were just activated. The IBUKI was launched at 12:54 p.m. on January 23 (Japan Standard Time.) Its initial functional check has been carried out on schedule, and the satellite is in good condition. We will continue to carry out the initial functional check, which is scheduled to be completed in three months after its launch. JAXA, the National Institute for Environmental Studies (NIES), and the Ministry of the Environment (MOE) will then cooperatively carry out the initial calibration and validation operations including comparing IBUKI data and data acquired on the ground, confirming the data accuracy, and making compensations based on the data. JAXA reignited the ion engine of the Asteroid Explore "HAYABUSA" for a powered flight at 11:35 a.m. on February 4, 2009 (JST.) The HAYABUSA arrived at the asteroid "ITOKAWA" in 2005 and is now scheduled to return to the Earth in June 2010.We will continue to gradually accelerate the HAYABUSA by the ion engine until around March 2010 to carry out the second phase orbit maneuvering for returning it to the Earth. We will start the initial functional verification phase to check the onboard equipment function for about three months. Photo: The IBUKI taken from the ground radar of the Research Institute for High Frequency Physics and Radar (FHR), Research Establishment for Applied Science (FGAN), Germany. The Greenhouse Gases Observing Satellite "IBUKI" (GOSAT) was launched by the H-IIA Launch Vehicle No. 15 (H-IIA F15) at 12:54:00 p.m. on January, 23, 2009 (Japan Standard Time, JST) from the Tanegashima Space Center. The launch vehicle flew smoothly, and, at about 16 minutes after liftoff, the separation of the IBUKI was confirmed. New launch set for 12:54 p.m. on Jan. 23 (Fri.) for "IBUKI"
The launch of the Greenhouse Gases Observing Satellite "IBUKI" by the H-IIA Launch Vehicle No. 15 was rescheduled to between 12:54 p.m. and 1:16 p.m. on Jan. 23 (Fri.) (Japan Standard Time, JST.). JAXA's broadcast of the event will start at 12:30 p.m. on January 23 (Fri.)You can enjoy the broadcast through the Internet or at various public viewing areas in Japan including JAXA offices, JAXAi, some science museums, and universities. In addition, some cable TV channels and mobile phone service providers will broadcast the report. * We continue to examine the weather to make the ultimate decision of the launch on Jan. 23. The launch of the Greenhouse Gases Observing Satellite "IBUKI" (GOSAT) by the H-IIA Launch Vehicle No. 15 (H-IIA F15) was decided to be postponed as bad weather is forecast around the time of the countdown operations staging one day prior to the launch day. The launch was originally scheduled for January 21, 2009 (Japan Standard Time, JST). The new launch date will be January 22, 2009, or later. We will carefully monitor the weather conditions to determine the date. On January 11, the Greenhouse Gases Observing Satellite "IBUKI" was moved to the Vehicle Assembly Building (VAB). The satellite will be loaded onto the H-IIA Launch Vehicle No.15 to be ready for launch. On the 21st, JAXA broadcast will be on air from 12:30 p.m. We will report the launch live from the Tanegashima Space Center. You can enjoy the broadcast through the Internet or at various public viewing areas in Japan including JAXA offices, JAXAi, some science museums, and universities. In addition, some cable TV channels and mobile phone service providers will broadcast the report. * The JAXA broadcast schedule date and time are subject to change due to the progress of launch operations and weather conditions.